Denis's introduction: For Jan Verkade, painter, Oblat. OSB Published in L’Art et la Vie, October, 1896. "Our readers will readily note that the opinions expressed in this article differ on more than one point from those customarily held by L’Art et la Vie. We are nonetheless happy to publish them, as we believe they will give us material for interesting and profitable discussion; there shall be a response here in one of our forthcoming issues. N. D. L. R."
(1) Maurice Pujo (1872 - 1955), one of the founders in 1898-9 of Action Française and founder in 1908 of its youth wing, the Camelots du roi. In 1896, however, when this article was published, Pujo still thought of himself as a Republican and his philosophy was classified as 'integral idealism' deeply influenced by German philosophy. Denis' note is probably reminding him of past errors! (2) Gabriel Trarieux (1870-1940) was the son of Ludovic Trarieux who, as Minister of Justice in 1895, was one of the first to doubt the guilt of Dreyfus and who later founded the Ligue des droits de l'homme. Gabriel was a friend of Maurice Denis at the Lycée Condorcet and became a prominent symbolist playwright prior to the 1914 war. If God had granted me the grace to be born several centuries earlier, in the Florence of brother Savonarola, I should certainly have been among those defending, with childlike and vigorous ardor, the medieval aesthetic against the invasion of classical paganism. I would have been one of those pious recalcitrants, faithful to the hieratism of the past, for whom the new ideas announced a rapid decadence. A little pupil of Angelico, coming down on feast days from San Marco to the Signoria, together with the repentant painters and the crowd of believers, I would have hurled abuse against the Renaissance. It was the agony of an age of religious art, the most beautiful, the most bountiful following centuries of humanity on the earth. It was also the end of an aesthetic tradition, essentially healthy, logical and fruitful in masterpieces. And I think also of you, Jan, who have found happiness in that German monastery, (3) where you consecrate your life and your art to the cult of restoring that Christian tradition that has been forgotten since the Renaissance. (3) The Benedictine monastery of Beuron, in Hohenzollern. Here at this end of the century which is, nonetheless, so open to belief, where one may see the little flower of Faith unfold in souls crushed by the burden of the most erudite blasphemies, (4) we are a group of painters, close to conversion, as was old Botticelli during the time of Brother Savonarola. But we are not sure of our path. (4) He may have in mind particularly J.K.Huysmans whose blasphemous novel A Rebours (1884) shows a remarkably detailed knowledge of Catholic literature and philosophy. In 1895, the year before the present essay by Denis, he published En Route, the second part of a trilogy showing the process by which the protagonist, Durtal, who in the first novel, Là-bas, is showing an unhealthy interest in Satanism, converts to Catholicism. There are those, nonetheless, who know that Christian Truth defines not only the goal of their art, but the means which they must employ. There are also those who have no idea of all that the good masters of the past - some of whom had mediocre minds, and some hearts without Faith - owed to the discipline of the Church. But we are all preoccupied with God. Christ lives today. The time is ripe. There has not for a long time been an age more impassioned for religious beauty than our own, and if this has become a fashion - and that is a complaint one hears - still, in this way, something of the truth is being revealed. Yes, it is our fondest hope that even a single one of our works might propagate and perpetuate a little bit of the Truth from on high. Painters speak of God only as beauty, purity, and logical harmony. After the Word is stilled, as the Councils teach, the spectacle of the images continues to speak to us, teaching the truth of the acts of God. A photograph of a painting by one of the primitives is enough, amid the disorder and tumult of life, to remind us what our souls are, that its gestures are sublime, and that, unknown to us, there is a pure light that gives us consolation. And it is also the painters who furnish God with the form of the visions which he has bestowed, across the centuries on Saints and simple folk. The painters collect, they invent, the ideal of divine beauty scattered among the souls of their time, in order to realise it and to impose it in their turn. Those who "see" only see through forms which the painters have created. Read once more the descriptions of the apparitions of other times and of our times. Is it not the iconography of Flandrin or Signol (5) that must be blamed for the poverty of recent miraculous apparitions on our French soil to this or that humble shepherdess? Painters are responsible for the visual beauty of Religion. (5) Hippolyte Flandrin (1809-64). Pupil of Ingres. Made an intense study of Renaissance fresco techniques and decorated many churches notably St Germain des Près. Émile Signol (1804 - 1892). Also a pupil of Ingres. He decorated the churches of Saint Roch, Saint Sévérin, Saint Eustace, and Saint Augustin and has four paintings in the Saint Sulpice church in Paris (which also houses work by Delacroix). In an essay also included in Théories on Ingres's pupils, written in 1902, Denis gives a more favourable impression of both Flandrin and Signol: "It is remarkable that in teaching Nature and his own ideal, he [Ingres] could form pupils who were in turn able, even when they thought they were copying, to create poems of naivety, austerity, majesty (grandeur) or high dignity (emphase) - Janmot, Flandrin, Mottez or Signol - instead of being content just to transpose the model." 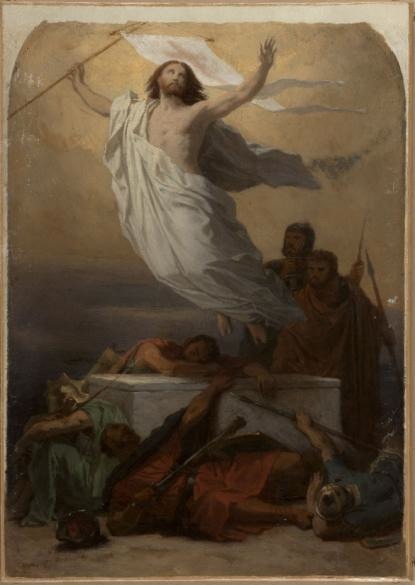 Émile Signol (1804-1892): The Rseurrection of Christ, sketch for the Church of St Eustace, c1856. I do not speak of the seduction of Christian subject matter; that is, properly, the material on which the masterpieces are based. Moving scenes, essential gestures, beauties of human expression that can only be found in the holy books. The Noli me tangere and the Holy Mother will dominate the tender meditations of painters to the end of time. There are two kinds of religious painting. The one is sentimental, if I dare say so, restoring the beauty of the attitudes of prayer, of heads inclined in ecstasy, of kneeling; purity, naïveté of veiled young girls, the nine hours in the morning of a first communion. It is the feminine manifestation of Catholicism, the art of fashioning scenes with the memory of pious feelings, of showing the Saints, the Spirits, (6) wrapped in such feelings; to picture God in the image of our sorrows, of our melancholy, of our desires. The other is less inspired by life and, in order to realise the absolute, turns to the intimate secret of nature - to number. From the mathematical relations of lines and colours there appears a supernatural Beauty which is only slightly troubled by a hint of human suffering which runs through it, as if to add a discreet accent of life and of prayer to the expression of divine harmony. That is the prestige of the perfect chord, the splendor of immutability. Instead of evoking before the object that is being represented emotions we have experienced in the past, it is the work itself which wishes to move us. This unshakeable spiritual beauty is complemented by the beauty that surrounds it; the admirable harmonies are a representation of the truth from on high; proportions express concepts; there is an equivalence between the harmony of the figures and the logic of Dogma. 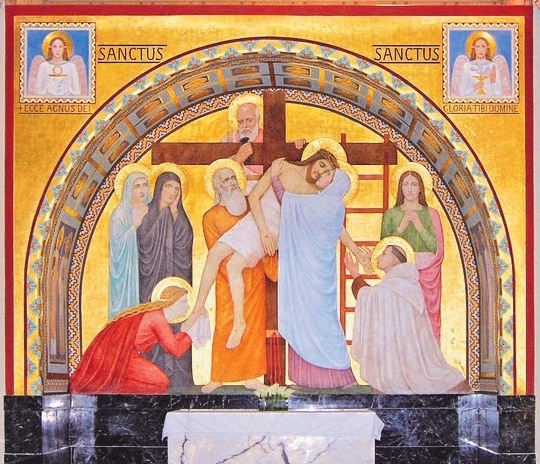 Think of the Egyptians, of the Byzantine mosaics in Italy, of Cimabue. Note the evident similarity between those ideas and that which was once called "Symbolism".